Liquitex Professional Soft Body Acrylic Paint has been re-designed! It is the same original Liquitex Soft Body Paint but in a new bottle. The newly designed ergonomic bottle has been developed with artists to be easier to use and store and more functional. Not a drop of paint will go to waste - much better than the old tubes! Simply pull off the white lid to reveal a precision nozzle which can be cut to size. Or, unscrew the whole cap and dip your paintbrush straight into the bottle or pour out the acrylic. 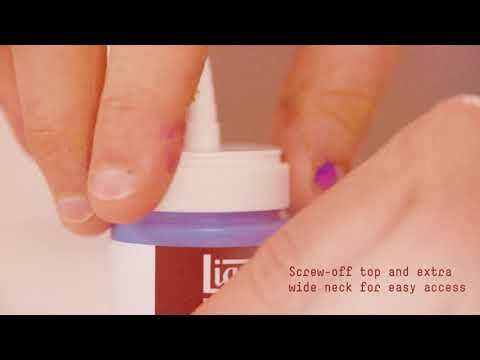 Liquitex Soft Body is a water-based artists acrylic with low viscosity (it’s very fluid). This makes it an ideal choice for fine detail painting, pouring (great with Liquitex Pouring Medium & String Gel), glazing, blending, printing, mixed media, collage, airbrushing and more! It is a very versatile acrylic because it can be used on virtually any surface, including canvas, wood, fabrics, glass, paper & board, metal, plaster, brick, clay, etc. Liquitex Soft Body Acrylic has high concentrations of ultra-fine artist-quality pigments so a little goes a long way. Each colour is made from carefully selected pigments so that colours are pure – ideal for colour mixing. This also results in minimal colour change from wet to dry. This acrylic paint has a smooth and creamy texture with a satin finish. It gives excellent surface coverage and retains little or no brushstrokes. Choose from 100 lightfast colours in the 59ml range, including the new cadmium free colours. You can combine any of the Liquitex paints and mediums with this soft body acrylic, including Liquitex Inks, Liquitex Spray Paints & the new Liquitex Acrylic Gouache. Liquitex Soft Body Acrylic Paint is safe for studio and educational use (Approved Product AP seal).